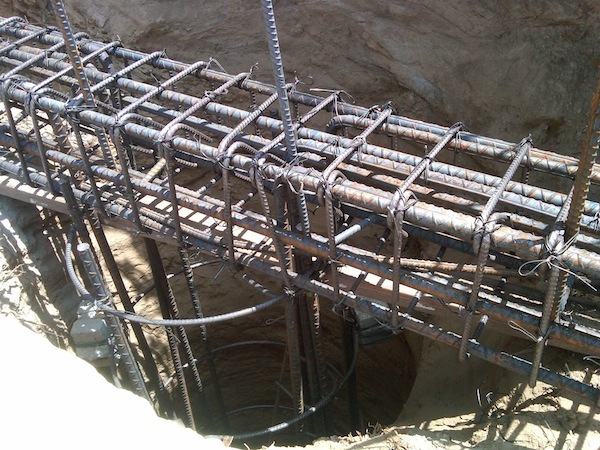 LARC Foundation Works provides caissons and grade beams to residential and commercial properties in Los Angeles, CA. Caissons and grade beams are most frequently used for hillside home stabilization, or to support retaining walls. They are often the perfect way to protect your property when other foundation system are inadequate. What are Caissons and Grade Beams? Caissons and Grade Beams are foundation supports systems constructed by placing fresh concrete and reinforced steel (rebar) into a deep, drilled shaft hole. These reinforced concrete piles are cast in holes drilled through soil and rock layers down to the desired bed rock. This permanent substructure permits excavation to proceed inside while being sunk into position, and also provides protection for the workers against water pressure and collapse of soil. The term caisson refers to a wide range of foundation structures. Caissons may be open, pneumatic, or floating type; deep or shallow; large or small; and of circular, square, or rectangular cross section. Caisson walls may consist of timber, steel shells, or concrete. Large caissons are used in foundations for structures, such as bridge piers, and deep-water wharves. Small caissons are used singly or in groups to carry such loads as building columns. Caissons are used where they provide the most feasible method of passing obstructions, where soil cannot otherwise be kept out of the bottom. Why Do I Need Caisson Foundation Repair? Building and safety requirements mandate Caissons and Grade Beams as part of a new construction, addition, or in any instance it is recommended by structural or soil engineers. Caissons and Grade Beams are capable of supporting high, concentrated loads and are typically used to set piers for bridges, underpasses, structural supports, as well as in slide prevention applications in residential homes. Caissons are viewed as a reliable, versatile, and economical foundation support solution in Los Angeles, CA. 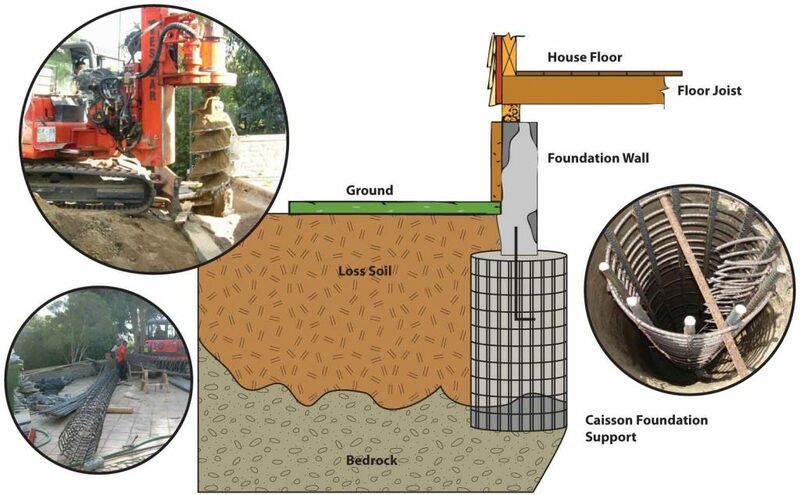 Caissoning work is the process of drilling 24”+ round holes in the ground down to the bedrock layer, and is especially important for houses located on hills or unstable soils in order to prevent the house from sinking. Whether you require Caissons and Grade Beams due to problematic soil conditions, or you own a hillside property, LARC can help.